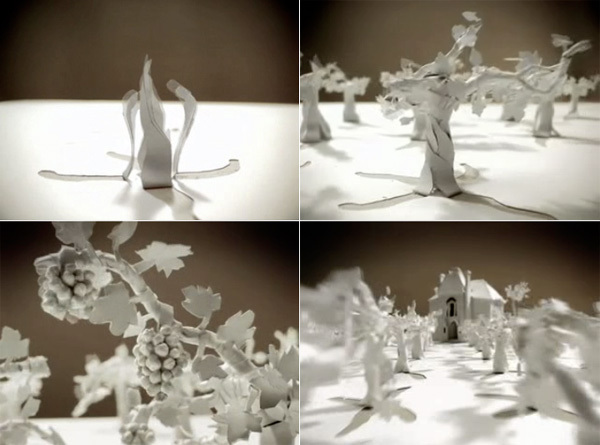 Sam just emailed me about this incredibly mesmerizing paper animation by Olivier Gondry for Beringer Vineyard - it will make you want to drink wine and crush paper. View it here. Here’s the making of video posted on you tube. i’ve found the ‘making of’ video on Su Blackwell’s website.. she was a consultant on the project. Me too!!! I was SOOO amazed at how beautiful this ad was! Good eyes NOTCOT and way to step up the cheezy wine ads, Beringer!!! Hey, I actually saw this on TV yesterday and thought about posting it, but you beat me to it Jean! Wonderful commercial :) Too bad there’s no making of like the Sony Bravia ads.